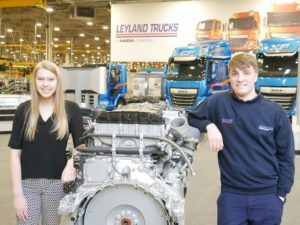 Leyland Trucks will recruit 19 apprentices in 2018 to join the 43 apprentices already on the programme. The company, based in Leyland, Lancashire, produces the full range of DAF Trucks for the European and UK market and has a long history of building and recruiting its workforce through its apprenticeship programme. In 2017 the firm won The Manufacturers MX Awards for Partnerships with Education, in recognition of its work supporting education programmes at all levels across the Lancashire region. Apprenticeships at Leyland are a mixture of training on the job and classroom-based learning in partnerships with local colleges. Every apprentice is given a structured development plan that includes rotating between departments to give them a broad experience of the company.